But if I’ve not been writing here, I’ve been writing elsewhere. I’m in the middle of something unusual for the Australian Horror Writers Association (more on that nearer completion), and earlier this week I finished off a project I’ve been chipping away at since just before Christmas – a new Doctor Who short story. It’s for Myth Makers, the fiction anthology of the Doctor Who Information Network, and the first magazine ever to publish one of my short stories. In fact, it’s safe to say that being picked up for Myth Makers kickstarted my writing in more ways than one. Not only did it get me “off the mark”, it also led directly to my being noticed and commissioned by Big Finish for their Doctor Who and Bernice Summerfield ranges. You can find out more about Myth Makers at the DWIN website, where you can also pick up back issues of the magazine. I work better when there’s a deadline. If I’m allowed to bimble my way through a project and just get it in whenever, it’s a surefire way for me to spend all day slobbing in front of the xBox with a coffee drip in my arm. So yes, I like deadlines. There. I said it. Unless they’re day-job deadlines. Twelve weeks of them, one after another after another, without let up, a sequence of circumstances combining to create the Perfect Shitstorm. So for the last couple of months I’ve written precisely nothing – the last thing I’ve wanted to do with my spare time has been stare at a computer screen. That’s not to say I’ve not been ‘writing’ on some level. Little ideas have been jotted into notebooks, and plots have been simmering at the back of my head, but it’s only now, with Christmas approaching and the pressure lessening, that I’ve been able to actually sit down and write. In other news, I’ve had a couple of stories released since I last posted here. Bloodstones (edited by Amanda Pillar for Ticonderoga Publications), which features my story Dead Inside, hit shelves last month, at almost exactly the same time as the latest volume of The Year’s Best Australian Fantasy and Horror. That’s also from Ticonderoga, and includes a tale of mine from 2011, Someone Else to Play With. 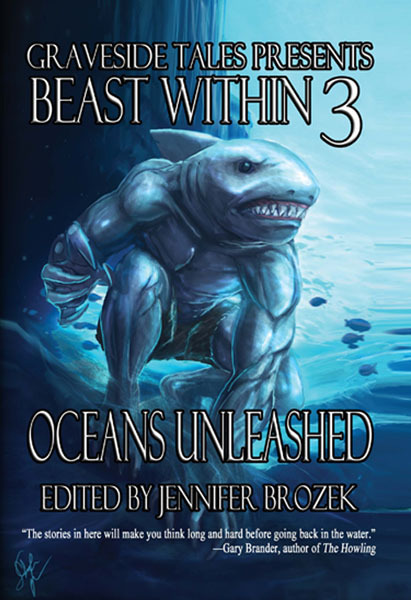 Up in the Northern Hemisphere, meanwhile, Graveside Tales released the third volume of its Beast Within series, Oceans Unleashed, at the start of December. 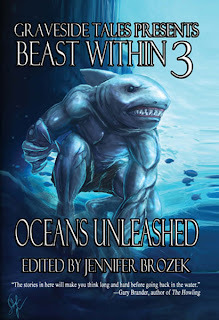 Edited by Jennifer Brozek, it’s a collection of stories blending lycanthropy and marine life, and features Dry Run, a tale I wrote about thwarted love and shark attacks. And that’s it for my pre-Christmas output – but as one last thing, I would just like to throw out a big hooray to World’s Collider, which made number two on Amazon’s list of sci-fi books a couple of weeks back. It’s a great collection, and a real labour of love for editor Richard Salter – you’d do well to check it out, if you haven’t already. 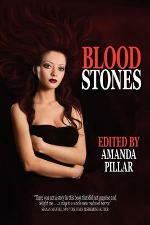 The end of the month sees the release of Ticonderoga Publications' latest anthology, Bloodstones. 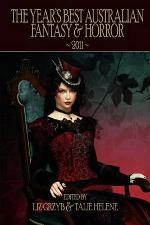 It's a collection of urban horror tales with a mythological spin, one of which - Dead Inside - was written by yours truly. Another of the contributors to the book, Erin Underwood, took the time to interview the collection's editor, Amanda Pillar, as well as posing some questions to the authors. So for an idea of what the book holds, plus a glimpse into the individual fears of the writers, pop along to Erin's blog and have a quick read. (Bloodstones is released at the end of October, and can be ordered from Ticonderoga directly, as well as being available from Amazon and The Book Depository). You like free stuff, don't you? Of course you do! So you'll be very pleased to hear that this weekend, Nightscape Books has decided to make three books available for Kindle download absolutely gratis. 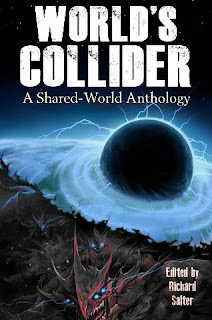 That means you can pick up a copy of the mammoth World's Collider (featuring my story Closure), as well as Trent Zelazny's Butterfly Potion and A Requiem for Dead Flies by Peter N Dudar... and it'll cost you nothing. I did mention that bit, didn't I? Well that's rolled around quickly: tomorrow's the Spec Fic Writers mini-con at Katharine Susannah Prichard Writers Centre in Greenmount, where a host of WA writers, editors and publishers will be getting together for talks, panels, signings and the like. I'll be taking part in a panel at 1pm, focusing on critique groups and crowd-sourced editing, but the day's programme kicks off at ten with the first talk about breaking the rules of writing. You can find full details of all the events at the KSP blog. Hope to see a few of you there - it promises to be a great day! Every two years, the Katherine Susannah Prichard Writers Centre in Greenmount, just outside Perth, holds a Mini Con for readers and writers of speculative fiction, and I'm excited to say that this year I'll be one of the writers attending. There'll be panels (I've volunteered for one, but haven't had it confirmed yet), a book launch and copies of author works for sale, all packed into the one day, Sunday 9 September, and all for less than $20. As soon as a timetable of the day's events is available I'll post it here, but in the meantime you can keep up to speed about the con and attendees at the Mini Con blog. World's Collider - out now! I'm very pleased to announce that World's Collider is now available to buy in ebook and dead-tree formats. It's a 'mosaic novel' - that's to say several short stories that fit together to form a single narrative - and at a monster 468 pages it's been a mammoth undertaking for the editor, Richard Salter. The book features stories by James Moran, Trent Zelazny, Steven Savile, and many more besides (yes, that includes me) and can be picked up from the Nightscape Press website, with links up in the next 24 hours for Amazon and the like. But why wait? Kindle edition is only $2.99 and you can have it right now. Yes, now! And while you're waiting for the download, you can read Richard Salter's list of strange facts about the book, or the round-table interview he conducted last week with the majority of the writers.